Given that the nature of True North is a story of difficulties in childhood caused by child abuse that were overcome by seeking out supportive environments, organizations, people, etc., here is a helpful list for those who might be in need of support with their life circumstances. Thanks go to Siobhan Greene, director of Voices for Children – CASA Monterey Peninsula, www.voicesforchildrencasa.org for the list of child support agencies. Office of the Attorney General - California Missing Persons. The legalities….but more importantly where the information can be found that should be filed when a child is missing. Chapin Hall Center for Children – Youth Who Run Away From Substitute Care. A study/paper that was done by the University of Chicago. Based on Illinois statistics over a ten year period (1993-2003). While not from our state and done a few years ago, the information and graphs are really interesting. Disclaimer: This information is not intended as a substitute for medical advice from a qualified physician. If expert help is needed, the services of an appropriate medical professional should be sought. Author Tom North Wins Living Now Book Award Gold Medal! 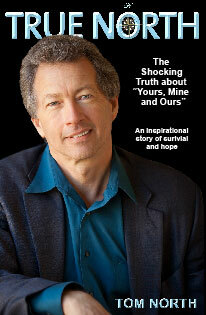 TRUE NORTH PRODUCTIONS ANNOUNCES RELEASE OF NEW AUDIO BOOK NARRATED BY TOM NORTH. Tom North is featured in an interview/article/blog on the International TM Sites, tmhome.org, tm.org and the David Lynch Foundation. Tom North article is featured on The Chronicle of Social Change. Don't miss any of Tom's posts! Subscribe to our RSS feed!